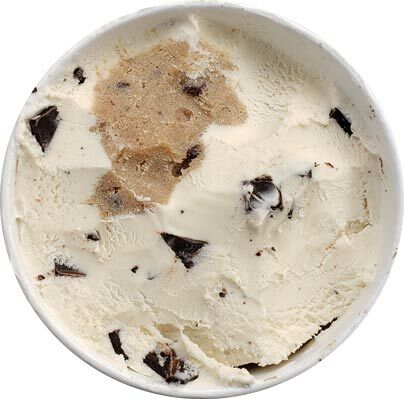 [New for 2019] Time to try the last of the three new cookie dough core flavors from Ben & Jerry's. I think the sweet one is better than the no bake one, and this is the simplest sounding of the bunch, but let's see if this is better than both of them. That looks pretty tempting now right? We've got a decent amount of chips and the bigger end (top side) of the cookie dough core. 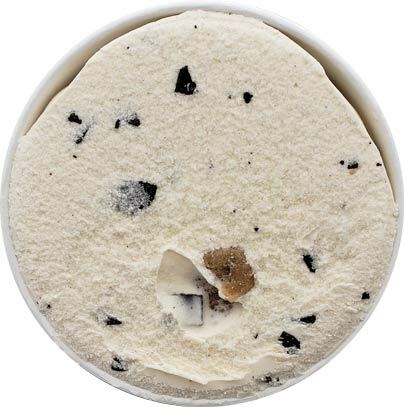 I think seeing some actual cookie dough would have been cool too, but they missed that step on this final core flavor (the other two have cookie chunks in them). I dig in and enjoy. It's not amazing per say, but it's easy enough to like. I would have liked to see a bit more pop from the "cookie milk" base (something akin to Turkey Hill's cookie dough flavor before they cheapened it), but it still adds a little bit to the mix. Same goes for the core. It's enjoyable, but not amazing. I think many of us thought that the cores would be literal cookie dough, but yet again it's something a bit more gritty and simplistic than that. So to keep it short, it's fine, but not amazing. All three cores failed to go all out. Sure, they add some texture change, but I feel like most of us will go "yeah, but it could be better". I know, I'm picky, but I wanted a bit more pop from this and the other cores. This still winds up being my favorite of the three. On Second Scoop: Ok, another big chunk of this pint is gone and I teeter totter between "at least it's fun" and "why couldn't they give it a bit more pop?". This is 2019 and social media standards are high. Plenty will enjoy this, but there will be an understandable mass that expected more and I think they are right too. The cookie dough core was a good idea, and for me personally, it's a step up from most of the other cores, but it still feels like they missed the mark. The core should be a little less gritty and a bit more flavorful and sweet. I want cookie dough, not a rough approximation of it. Yes I understand they have to make it work with machine and be safe and all that, but I think they could have done better. I would love cake batter cores. If that ever happens, I'll raise a spoon in honor of Dubba Scoops. Can you let us know if the core actually made it to the bottom? Also, woould you guess that there is more total cookie dough in these core pints or in the regular cookie dough? @Deb: Yeah, I've heard several complaints about the core not making it to the bottom but I'm 3 for 3 on a "complete" core. It's definitely more of a funnel than a cylinder, and in one case the core seemed to "jump" (seperate) about an inch from the bottom. Very disappointed in this one. 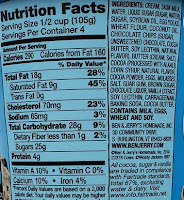 The fudge chips are good: nice texture, can taste them but not overpowerful. 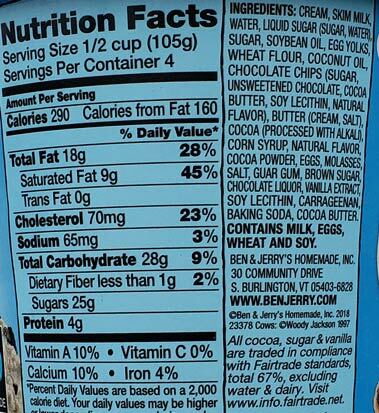 The ice cream is fine as a relatively mild base but, to make up for the sugar/price, needs to have some powerful mix-ins, which the fudge chips alone do not provide. However, the big selling point and issue (for me) was the core: it was terrible, or just very different than I was expecting. I can't believe anyone (let alone someone like Ben & Jerry's) would intentionally put out something that tasted this bad to me, so maybe it's just a "different" interpretation of what a chocolate chip cookie (I'm not even sure someone like me could mess up a chocolate chip cookie) is. It's bland and what taste is there is bad. I'm struggling to describe it, but it's almost like it tastes like some of the ingredients for a cookie (it doesn't taste like raw cookie dough, which I may have eaten too much of at times), particularly brown sugar and maybe butter. It did not taste like a chocolate chip cookie to me, and certainly not a good one. Even though I tried to defend it with "different", I've had B&J's chocolate chip cookies before (Half Baked, though it's been a few years) and enjoyed them. 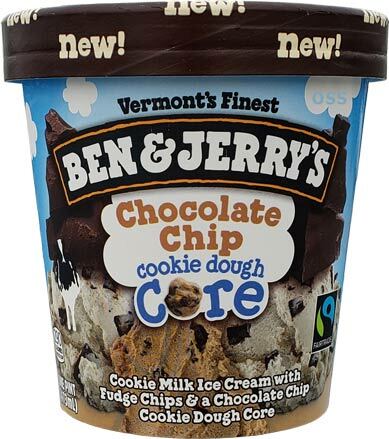 I'm sure something different has to be done for the core line rather than just smashing together some "gobs of chocolate chip cookie dough" from Half Baked, but this ain't it, Chief, at least for me. It did look like the core went most of the way down, but I can't be sure as I threw this ice cream out with about half of the container left. After the initial unpleasant first bite, I tried a small bite, a bite mixed with ice cream (which made it a little better, but the mild taste of the ice cream was largely overwhelmed by the core), a bite after a scoop of just ice cream, and none of it made it worth eating. Maybe I just got a bad batch and/or am just wrong on what a chocolate chip cookie should taste like (it does have some terrible reviews on the B&J website, so maybe it's not just me, though I imagine complainers are more likely to post feedback, plus B&J's keeps making these cores, so enough people like them), so I hope others have experiences closer to Dubba's. I have to agree. The core was different, and unfortunately I didn't really enjoy it as much as I hoped.